25th September, Ashgabat: Korean men and women totally dominated the 6-games Team of Four preliminaries of the 5th Asian Indoor & Martial Arts Games with big margins to advance for tomorrow's semi-finals shootout as topseeds. Indonesia's Diwan Rezaldy, Fachri Ibnu Askar, Billy Muhammad Islam and Hardy Rachmadian got off the block with a scintilating 999 to lead defending champion, Hong Kong by 16 pins and Qatar in third, a further 115 pins away. Although the leader knockced down only 826 in the second game, they were able remain in the lead as well as stretching their gap over Hong Kong to 51 pins. China moved up into third, 52 pins adrift Hong Kong. Korea started poorly with 819 and 809 and was languishing in fifth. Indonesia ended the first block with 794 to lead with 2619. The Korean quartet of Choi Bok Eum, Cho Young Seon, Kim Kyung Min and Kang Hee Won fired a stunning 949 in the third game to leapfrog into second spot on 2577, 42 pins behind. China finished third with 2556 while Thailand took fourth spot with 2493 followed by Hong Kong completing the top five with 2489. After the lane dressing break, Korea resumed the fourh game of the second block exactly where they left off, reeling in another stunning 957 to take over the running. Indonesia followed closely behind in second while China remained third. Despite posting 880 in the fifth game, the Koreans bounced back with the highest game of the event with 1029 to win the preliminaries with 5443 and to advance to the semi-finals as topseed. Indonesia kept pace with the Koreans to finish in second with 5280. Chinese Taipei's Tsai Yong-Hao, Chen Chia-Hsing, Teng Jui-Pu and Singles bronze medallist, Wu Hao-Ming stormed home with a strong final game of 985 to clinch third spot with 5116. Qatar's Jassim Al-Muraikhi, Saoud Ahmed Abdulla, Yousef Al Jaber and Ghanim Aboujassoum snatched fourth spot with 5111. Thailand missed the cut by 48 pins after they finished fifth with 5063. Korea will face Qatar and Indonesia will meet Chinese Taipei in the one-match semi-finals tomorrow. The winners will advance to the September 27 finals while the losers will earn a bronze medal each. Meanwhile, Korean women stamped their mark by comfortably winning the preliminaries after a keen tussle with the Taiwanese quartet. Kim Moon Jeong, Hong Hae Ni, Baek Sung Ja and Jung Da Wun totaled 5004, 108 pins ahead of Philippines. 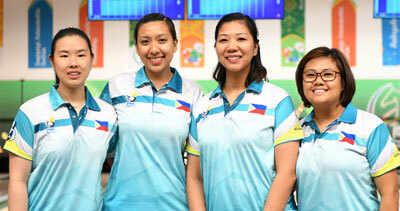 Liza Del Rosario, Alexis Sy, Lara Posadas and Krizziah Lyn Tabora amassed a total of 4896 behind the mighty Koreans. Philippines, who was fifth in the first block, posted two superb games in the fifth and sixth to move up to second. Doubles gold medallist of Zhang Chunli and Zhang Yuhong, who teamed up with Peng Rui and Yang Liyan, was second throughout the block but eventually settled for third position with a total of 4853. First block leader, Chinese Taipei dropped down to fourth with 4815 to qualify for the semi-finals. Thailand missed the cut by 18 pins after finishing fifth with 4797. Korea will face Chinese Taipei while Philippines will square off with China in the one-match semi-finals tomorrow. The winners will advance to the September 27 finals while the losers will earn a bronze medal each. The women's semi-final matches will be contested in the morning and the men's semi-final matches in the afternoon. The women's and men's final matches will be staged on Septmber 27. All matches will be individually telecasted LIVE on local TV stations.